Cabbage is prepared and consumed in many ways. The simplest options include eating the vegetable raw or steaming it, though many cuisines pickle, stew, sautée or braise cabbage. Pickling is one of the most popular ways of preserving cabbage, creating dishes such as sauerkraut and kimchee, although kimchee is more often made from Chinese cabbage . Savoy cabbages are usually used in salads, while smooth-leaf types are utilized for both market sales and processing. While the British dish bubble and squeak is made primarily with salt beef and boiled cabbage. In Poland, cabbage is one of the main food crops, and it features prominently in Polish cuisine. Sauerkraut is a frequent dish, either eaten on its own or as a stuffing for other dishes such as golabki (stuffed cabbage) and pierogi (filled pasta). Other eastern European countries, such as Hungary and Romania, also have traditional dishes that feature cabbage as a main ingredient. In India and Ethiopia, cabbage is often included in spicy salads and braises. In the United States, cabbage is used primarily for the production of coleslaw, followed by market use and sauerkraut production. Method: Carefully peel the leaves of the cabbage. Blanch (cook) them in salted boiling water for 1 ½ minutes, then refresh them in cold water. Place the cabbage leaves on kitchen paper to dry them. Heat up a pot on medium heat with a little bit of butter and olive oil. Add the diced shallots and crushed garlic, cook for about 2 minutes• Add the diced mushroom, chili flakes, smoked paprika and thyme. Cook for about 3-4 minutes then add the white wine and vegetable stock, reduce the liquid by half. Place the mix in the fridge to cool down. In a bowl mix both the minces and the garnish together, add 1 eggs, salt and pepper. Place a small amount of mince in the center of the cabbage leave and wrap the leaf around the mince making sure all sides are closed. Cook the stuffed cabbage in a pan on medium heat for about 5 minutes on one side, and then add 150 ml vegetable stock and cook for a further 5-6 minutes on the other side. 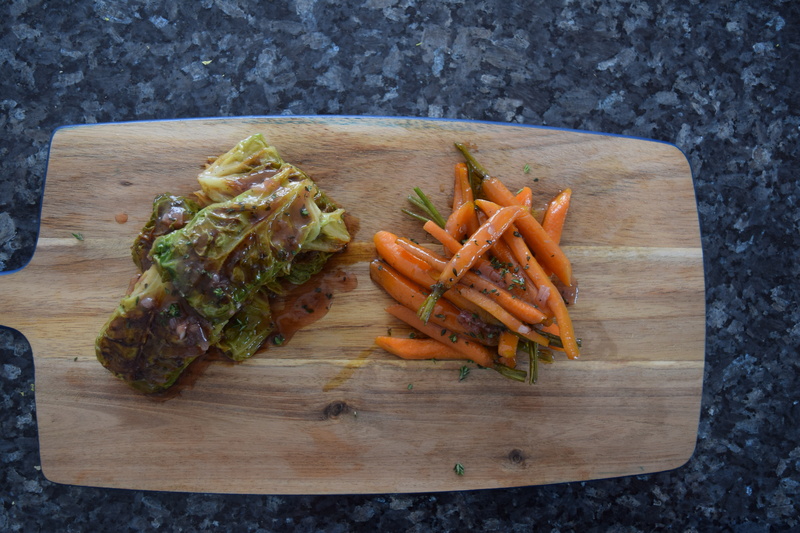 My favorite way to enjoy stuffed cabbage is with braised or roasted vegetables, what’s yours? Method: Cook the diced shallots, garlic and thyme for about 5 minutes on a medium heat. Add the port and reduce by half, then add the vegetable stock. Reduce the sauce by half. To thicken it to your liking, mix some melted butter and flour into a paste and whisk a little bit into the sauce. Cook the sauce for a further 5 minutes. Method: In a hot cooking pot, add a bit of olive oil and butter. Cook the diced shallots, bacon, garlic and chopped thyme for about 5 minutes. Add the cabbage, stir it and then add the white wine, turn the heat down, put the lid on and leave to cook for a good 10 minutes. Carefully take the lid off and season to taste. 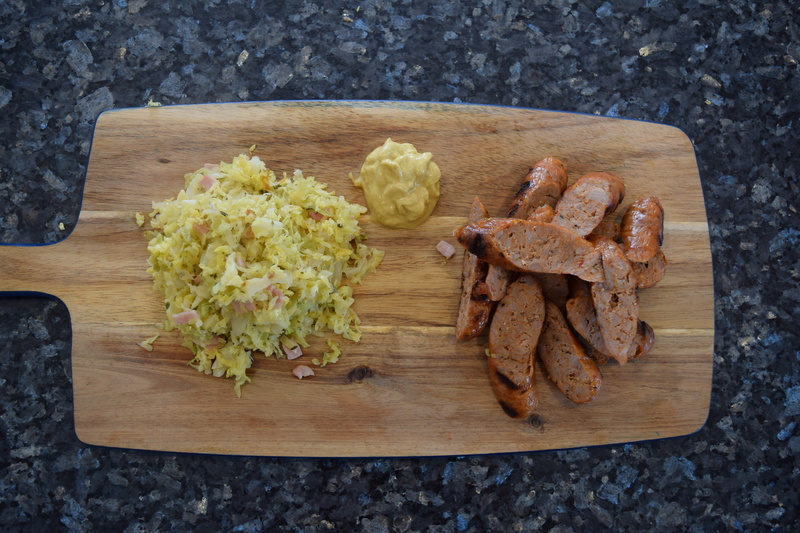 My favorite way to enjoy braised cabbage is to eat it with some delicious free range pork sausages. What’s yours?